Rosularia is a rosette forming member of the succulent family Crassulaceae (making them relatives of Kalanchoe and Jade Plant). 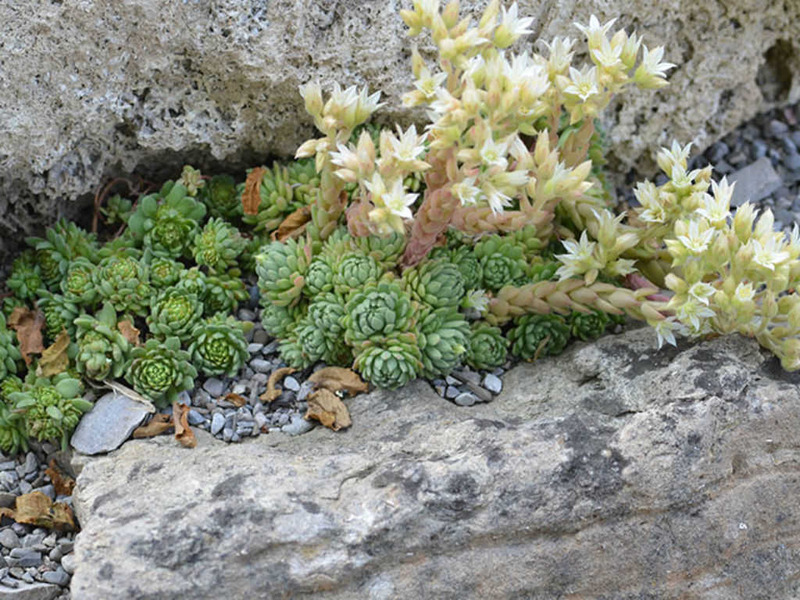 They closely resemble other rosette forming Crassulaceae such as Sempervivum and Echeveria, although they are more closely related to the genus Sedum. Rosularia‘s flat leaves range in colour from glaucus green to lovely dusky rose. The leaf margins may be lined with small hairs, called cillia or a contrasting colour to the rest of the leaf. The leaves will be brighter in summer, when the natural light is brighter. Rosularia tends to have small rosettes, and beautiful funnel or tube-shaped flowers which grow on tall inflorescenses (usually from the rosette’s center) and range in color from white and yellow, to bright pinks and purples and may be striped. Rosularia rosettes will not die after flowering (polycarpic, versus monocarpic). Rosularia blooms in late spring. Like Sempervivum, Rosularia are cold-tolerant alpine succulents which are found natively in the mountains and hills of Turkey, Cyprus, North Africa, and Asia. These plants are fairly hardy, but is a hard-to-find plant in cultivation. North and South American rosette-forming Crassulaceae are more common. Rosularia will propagate themselves through the formation of offshoots, also called “pups” (some species are more prolific than others). In cultivation, the grower would propagate Rosularia using leaf cuttings or separation of offsets. Light: Full sun is ideal in environments which are not too hot, but partial shade is satisfactory for most species. When grown in a hot environment, these plants should not be placed in full sun, or the plant will scorch and die. Temperature: Like Sempervivum, Rosularia will tolerate cold. This plant can withstand -10°F to 0°F temperatures (-23°C to -17°C). Water: Potted Rosularia should be watered when the soil is moderately dry. Allow the soil to dry out to a depth of 1 inch (2.5 cm) before watering, and be careful to avoid getting water on the leaves. In winter, the plants will require less water, as reduced temperature and humidity will induce dormancy. If you are unsure when to water your Rosularia, watch the lower most leaves for signs of drying and water them then. Soil: Rosularia can tolerate poor soil conditions, so long as it is well draining. Fertilizer: During the growing season, fertilize with a cacti fertilizer mix. Suspend feeding during the dormant winter period. As mentioned above, the plant self-propagates through offshoots, and given time one plant will form a dense mat of many. In cultivation, however, it is more common for the grower to use offset separation or leaf cutting methods. To separate an offset, remove soil from the base of the offset to find the stolon (thick root which attaches the pup to the mother plant). It is best to use an offset which has already established some roots of its own. Cut the stolon close to the pup (to discourage roots growing from the stolon). Place the offset into a small pot with well-draining, sandy soil. Do not water until new growth is noted. Leaf cutting entails cutting a young leaf from near the center of the rosette. Leave the leaf out in the open air for a day to allow the wound to callous over. Dip the leaf into rooting hormone (such as RootOne, which can be purchased almost anywhere you buy plants) and place the leaf (cut-side down) into slightly moist succulent mix potting soil (even better is very lightly moist sand). Soon, a new rosette will grow from the base of the leaf. As soon as enough roots are present to repot, remove the original leaf cutting and repot the rosette. It is best to pot at the start of the active growing season, in late winter or early spring. No pruning is necessary except to remove any leaves which have died. This will help to avoid rot and bugs. In the event of an unhealthy plant, the first thing to examine is your watering habits. The most common problem is root rot due to overwatering. If the soil is too wet, don’t hope it will safely dry out so long as you don’t water it for a while. Replace the soil immediately, and remove any damaged roots with sharp sterile scissors or a knife. One of the most common pests to houseplants is the mealybug, and your Rosularia may fall prey to this pest. However, due to the tightly packed leaves, more often than not the mealybugs will attack the roots. This makes them far less visible than mealybugs which attack leaf-stem junctions. The symptoms of a root mealybug infestation is slowed or stopped growth (though in summer this is a normal sign of dormancy). If this occurs without apparent cause, remove the plant from the pot and examine the roots. A white cottony substance on the roots and in the soil is a sure sign of mealybug infestation. Remove all soil and wash the roots gently. Remove any roots which appear damaged with a sharp sterile knife or scissors. Let them dry very throroughly before replanting. This plant is best grown outdoors and if you live in an area where winters temperatures rarely go below -10°F (-23°C), this is the best for Rosularia. When potted, these plants are very susceptible to vine weevil. The plant is often used as a bedding or groundcover plant. Whether grown outdoors or in, these plants are good to forget about. Too much attention by nervous gardeners will kill the plant. When grown outdoors in a wet environment, make sure that the soil is sandy and well-draining. If you aren’t careful, your plant will turn to rotten mush. Mix native soil with sand, if necessary. When grown indoors, a standard commercial cactus and succulent soil mixture works well.